Transpiration is the evaporation of water from plants. Most of the water absorbed by the roots of a plant—as much as 99.5 percent—is not used for growth or metabolism; it is excess water, and it leaves the plant through transpiration. Transpiration is very important for maintaining moisture conditions in the environment. As much as 10 percent of the moisture in the Earth’s atmosphere is from transpiration of water by plants. Transpiration occurs because plants take in more water than they actually need at a given time. It is a way of getting rid of excess water. When water is removed from the plant, it can more easily access the carbon dioxide that it needs for photosynthesis. Also, plants can use transpiration as a method of cooling themselves. Transpiration is used to describe the specific action of water evaporating from a plant, but the word transpiration is also used to generally describe how water moves through plants. When water enters the plant through the roots, it is pulled up through the xylem tissue in the stem of the plant to the plant’s leaves by capillary action and the cohesion of water molecules. When water reaches the stomata, which are small holes in the leaves, it evaporates due to diffusion; the moisture content of the air is lower than the moisture in the leaf, so water naturally flows out into the surrounding air in order to equalize the concentrations. Transpiration has side effects for other organisms in an ecosystem. It helps maintain a certain moisture level in an environment, depending on the number and types of plants in an environment. This inadvertently allows some organisms to survive better than others depending on the moisture levels that they need to thrive. Stomatal transpiration is the evaporation of water from a plant’s stomata. Most of the water that is transpired from a plant is transpired this way; at least 90% of the water transpired from a plant’s leaves exits through the stomata. Near the surface of the leaf, water in liquid form changes to water vapor and evaporates from the plant through open stomata. Cuticular transpiration is the evaporation of water from a plant’s cuticle. The cuticle is a waxy film that covers the surface of a plant’s leaves. This form of transpiration does not account for much of a plant’s water loss; about 5-10 percent of the leaves’ water is lost through the cuticle. When plants close their stomata in dry conditions, more water is transpired this way. Lenticular transpiration is the evaporation of water from the lenticels of a plant. Lenticels are small openings in the bark of branches and twigs. Not all plants have lenticels. The amount of water lost this way is very small compared to stomatal transpiration, but as with cuticular transpiration, it may increase if a plant is in a dry environment. There are many factors that affect transpiration. One such factor is temperature. When temperatures increase, the stomata of leaves open and more water transpires. Plants that grow in warmer climates transpire more. Moisture levels of the air and soil are other important factors. When relative humidity of the air increases, there is more moisture in the air, so transpiration decreases. However, if there is more moisture in the soil, plants will transpire more because they are taking in more water. More wind also increases the rate of transpiration because it decreases the relative humidity around a plant. Of course, some plants also just transpire more than others. Plants that live in dry environments, such as cacti, have evolved to conserve water in part by transpiring less water. This allows them to thrive in arid regions like the desert. Transpiration is part of the water cycle, also known as the hydrological cycle. The water cycle describes how water moves throughout the Earth. First, water transpires from plants and enters the atmosphere as water vapor. Water from Earth’s oceans, lakes, and rivers also evaporates into the atmosphere. The evaporation from Earth’s waterways and from plants via transpiration is collectively known as evapotranspiration. In the atmosphere, the water forms clouds, and then it falls back to earth again as rain or snow. Precipitation collects again in earth’s waterways, or it goes into the soil, where it enables plants to grow. Then water evaporates from plants, oceans, lakes, and rivers again, completing the cycle. 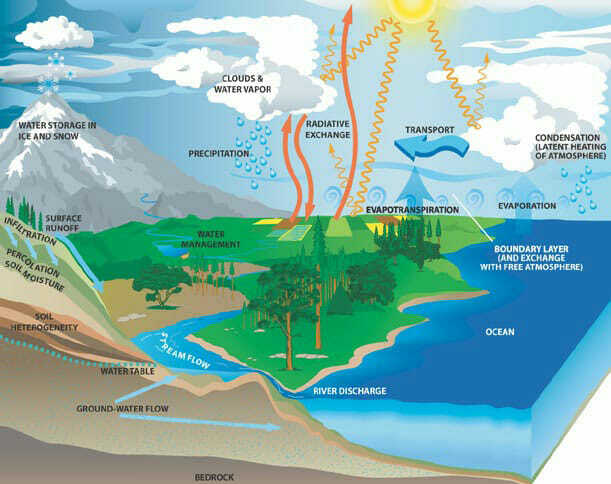 This diagram shows the Earth’s water cycle. Stomata – Small holes on the bottom of plant leaves that are used for gas exchange. Xylem – Tissue in plants that transports water and some nutrients from a plant’s roots to the rest of the plant. Lenticel – A small pore in the bark of a plant. Evapotranspiration – Evaporation of water from oceans, rivers and lakes, as well as from plants via transpiration. 1. Which is NOT a type of transpiration? B is correct. Lenticular, cuticular, and stomatal transpiration are forms of transpiration in which water is lost through the lenticels, cuticles, and stomata, respectively. Mesarchal transpiration does not exist. Mesarch describes a way that xylem can develop. 2. When temperature increases, what happens to the rate of transpiration? C. Transpiration stays at the same rate. A is correct. When temperature increases, transpiration also increases. Plants open their stomata more in hot environments so that water can evaporate, which cools the plant. Therefore, plants in hot environments generally transpire more than plants in cooler environments. 3. When _____________ increases, the rate of transpiration decreases. C is correct. When relative humidity is high, transpiration decreases. Less water evaporates into the surrounding air if the air has more moisture. When there is low humidity and the air is dry, transpiration increases. Water transpires into the air through diffusion; it moves from an area of higher concentration (the leaf) to an area of lower concentration (the air).